H. asked "How do you do your smooch?? Do you wipe off your base ink and color it in with a marker?". Close! In this case, I carefully applied my ink to the stamp (I used a small Memento dew drop), avoiding the smooch. 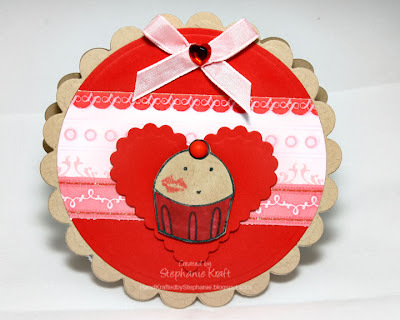 I then used a water-based red marker to color in the smooch, then I stamped the entire cuppie. Hope that helps! Today's card uses Monika's TECC52MD sketch. At first I was intimidated by it since it is a round sketch, but once I sat down to work with it, I loved working with it! My card is fairly simple, but I like how it turned out and love that it came together so quickly. I stamped my cuppie on Kraft cardstock before I colored him for a fun change of pace! Accessories: Circle and Heart Nestabilities (Spellbinders), Cuttlebug (Provo Craft), Markers (Copic), ribbon, heart rhinestone (Martha Stewart), candy dot (Pebbles), foam boosters, foam tape. Hey, how do you do your smooch?? Do you wipe off your base ink and color it in with a marker? Would love to know!